After checking the battery status, connect your digital camera to the PC. There are three ways to do that: using a USB cable, a Firewire cable or thorough a Bluetooth connection. For this tutorial we will use a USB cable to connect our camera to the PC. First, connect your digital photo camera and press the Power On button. Windows Vista, 7, 8 and Windows 10 will detect the camera and will install the appropriate drivers. After the drivers installation is finished, the AutoPlay menu will pop-up. 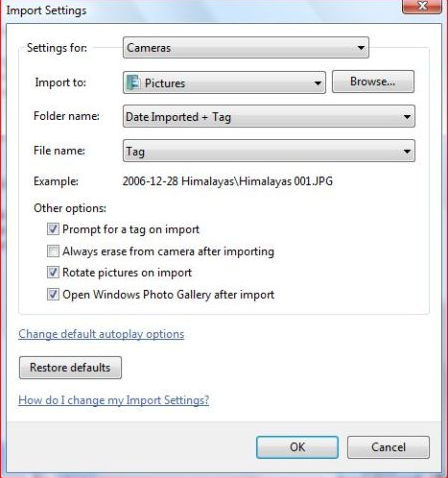 Select the option Import pictures using Windows. 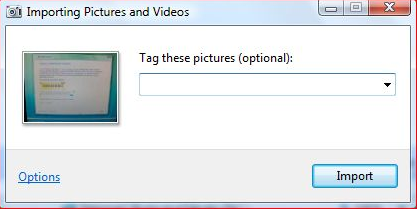 In the bottom right corner of the screen, a small window asking if you want to tag the pictures will appear. You can type a general tag for the pictures that you are about to import. Tags can be very useful for organizing and finding your pictures. If you don't want to insert a tag just leave that space blank and click on Import. If you want to customize the import settings, click the Options button. Now you can change the following settings: where to import the pictures (the default folder is Pictures - if you want another folder click on Browse and select or create that folder), the name of the folder (by default the name of the folder will be the date when the pictures are imported plus the tag you typed) and the file naming convention. When you have finished, click the OK button. These settings will apply to all the pictures you will import from now on. 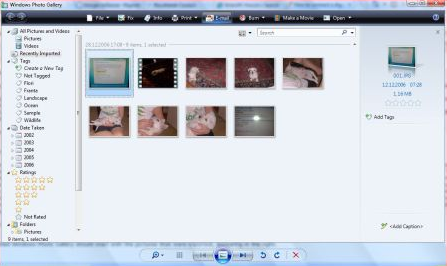 After you click on Import, Windows Vista starts moving all your pictures. 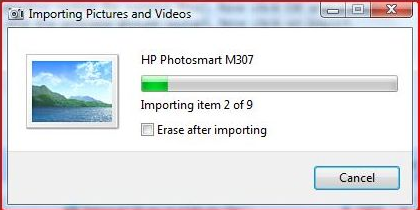 If you want the pictures to be deleted from your camera after the import process is finished, click the Erase after importing checkbox. After the process is finished, Windows Photo Gallery will start and you will be able to see all the pictures that were imported. Now, turn off your camera and remove the connection cable from your PC. 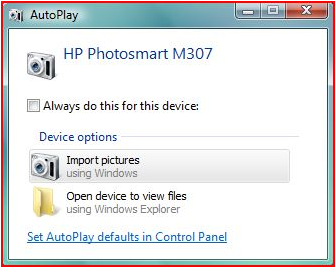 NOTE: For this tutorial we used a HP Compaq nx7400 and an HP Photosmart M307 digital camera. The same thing happened to me this week. It worked fine before. I cannot choose where my photos should be downloaded. Has there been an automatic update to Vista that caused this problem? Ok, here is what I have found... I was unable to bring back the old classic style of importing the pictures and tagging them all in one step, however, this is really not so bad... Read about halfway down this page under the heading "Organizing and finding your pictures." Hope this helps. As a daily importer of many photos, this was a lifesaver, as I was seriously about to go back to XP just for this feature.